Time-lapse imaging of individual developing neurons within intact tissues has revealed the dynamic nature of dendritic arbor growth during early brain development. Imaging within the intact developing brain has allowed direct observations of enhanced dendrite growth in response to visual stimulation which supports classical studies of the effects of environmental enrichment and sensory occlusion on neuronal morphology15. The molecular pathways responsible for such afferent innervation-directed neuronal growth are beginning to emerge, with initial activation of glutamate receptors and VSCCs as critical initiators of Ca2+ influx and activated release of additional Ca2+ from intracellular stores (see Figure 20.3). Figure 20.3. Synaptotropic Model for Dendrite Growth. (A) While growth cone filopodia are insensitive to activity, interstitial dendritic filopodia grow toward glutamate. Nascent synapses form on filopodia and confer structural stabilization. 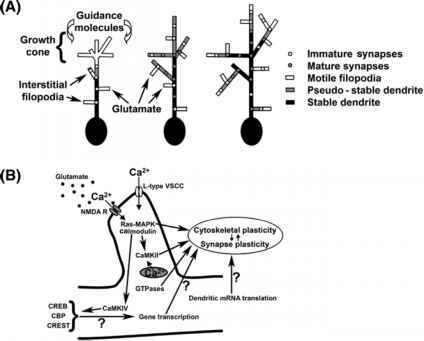 (B) Ca2+ entry through NMDA receptors and VSCCs on dynamic interstitial dendritic filopodia, and subsequent evoked release of Ca2+ from intracellular stores activate molecular cascades implicated in both synaptic and cytoskeletal plasticity. Direct and indirect interactions between synaptic and cytoskeletal proteins provide the possibility that synapse and morphologic stabilization/destabilization are coordinated events. Alteration in cytoskeletal components that give rise to dynamic filopodial motility (actin) and stability of mature dendrites (microtubules) are certainly endpoints for these pathways, but the intervening components have not been completely elucidated. Rapid effects on growth spatially restricted to the area around active synapses are likely mediated by local kinases/phosphatases and activation of small GTPases (see Chapter 21). Transient increases in Ca2+ may also regulate local translation of dendritic mRNA77. Slower effects that may induce larger changes in growth may involve transcriptional control mediated by CaMKIV, CREB, and CREST. Further work is required to determine which genes are activated by transcription regulators and how this expression translates into altered growth. Activation of the same pathways has been implicated in synaptic plasticity and imaging of the clustering of synaptic proteins shows a clear relationship between dendritic filopodial stabilization and the appearance of synapses. The synaptotropic model in which neuronal transmission and synapse formation contributes to dendritogenesis is strongly supported by these findings. Filopodial stabilization appears to involve a multistep process initiated by filopodial contact with presynaptic axons. Cell adhesion molecular interactions between pre- and postsynaptic membrane may provide early signals for cessation of filopodial growth since contact rapidly alters motility. The detectable coalescence of pre- and postsynaptic proteins is delayed following contact and may provide a distinct mechanism for increased stability through the accumulation of proteins with binding domains for cytoskeletal elements. Finally, activity-induced transcriptional and translational regulation may promote further stabilization of synapses and filopodia. Cytoskeletal stabilization and plasticity, however, must be well balanced to allow dendrite growth. Dynamic filopodia must be stabilized to prevent retraction, but retain plasticity for further extension to form longer mature dendritic branches from which additional motile filopodia can extend. Future investigations of mechanisms underlying activity-dependent growth during development will hopefully clarify the progressive changes in the sensitivity of dendrite growth to different external inputs as neurons progress through maturational states, each with its own complement of receptors, signaling cascades, and effectors.